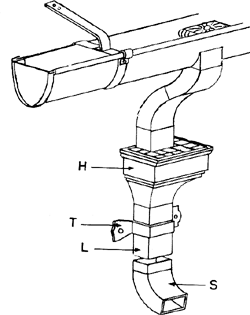 A vertical pipe that carries rainwater from the roof gutter to the ground or drain system. (Russian lider; from English “leader”). (1) The head of a political party, trade union, or other social organization. (2) The person who is in first place in some competition, such as the leader in a chess tournament or a bicycle race. the name of a class of ships (such as a large-displacement destroyer) in use in the Soviet Navy in the 1930’s and 1940’s. A leader carried the command of the unit and sailed first in the wake column. The term “leader” is sometimes applied to a vessel that heads a group or vessels of a caravan or fleet equipped for industrial uses or prospecting. The unrecorded length of magnetic tape that enables the operator to thread the tape through the drive and onto the take-up reel without losing data or recorded music, speech, or such. The streamer which initiates the first phase of each stroke of a lightning discharge; it is a channel of very high ion density which propagates through the air by the continual establishment of an electron avalanche ahead of its tip. Also known as leader streamer. A short piece of blank film at each end of a strip of photographic film or reel of motion picture film, used to thread the film through the mechanism of a camera or projector. Lines or rows of dashes or dots used to guide the reader's eye across a printed page. In a hot-air heating system, a duct that conducts heated air to an outlet. 2. A duct for conducting hot air to an outlet in a hot-air heating system. When a leader knows his onions, he is not afraid of taking a position and facing the consequences. Now a new generation of religious leaders has been used, as confirmed by David Kuo, once the No. The NYC Chapter Emerging Leaders Committee co-chairs are Laura Garcia, corporate real estate analyst, Lehman Brothers; and Cindy Quan, corporate real estate analyst, Goldman Sachs. Sheehy shows that the human side of the leaders in the immigration fight runs contrary to the demonized characterizations that the media usually show of them. In each place, we try to help leaders and citizens create a long-term approach that will help their particular area prosper in the context of local, national and global networks of trade, transportation, information and so on. Although it may seem counter to extant leadership theories and research, the leadership style of the follower has not been given attention as to the influencing, both formal and informal, that exists between leader and follower. The deals, given to the Legislature in the waning hours of the session last month, were rejected by Democratic leaders of both houses, who said more study is needed before a legislative vote. Those who have struggled with their pastor over sharply different viewpoints will tend to identify their leader as controlling, and this perception may over time permeate the whole congregation. Will is a whole leader, and Wes--as smart, competent, and technical as they come--is only a partial leader. This half-day conference will commence with a continental breakfast followed by a Workforce Development Panel of three business leaders from Sudbury with companies of 100 employees or less, as they share their experiences of workforce succession planning. In the usual process of leadership development, the evolving leader rarely interacts with the CEO of the organization outside of the top leader's formal role in meetings and presentations. If you push your own programs, you're ignoring some constituencies; if you do not, you are not a leader.